ADF Foods Limited try our best to infuse the right ingredients to make our products delectable. It is with this thought that we embarked on a culinary journey to chronicle a world of authentic foods. Pickles seasoned with spices, Ready-to-Eat meals, Chutneys, Garlicky-gingery Pastes, Sauces made of fresh ripe tomatoes marinated in finely chopped onions and herbs; is what constitutes our world. When we look back to the year 1932, we see a year filled with hopes, dreams, and possibilities. We see the humble beginning of a small retail store by the name – American Dry Fruits. With the passage of time, this retail outlet evolved and is now globally known as ADF Foods Limited. Today, ADF houses an array of traditional ethnic Indian, spicy Mexican and exotic Mediterranean foods. Our frozen foods, salted, sweet & savoury pickles or the wide variety of Pizza & Pasta sauces are relished in all diversified parts of the world. Our extensive food family that spans from Ashoka, Soul, PJ’s, Nates, Camel, Aeroplane to Truly Indian has been catering to the native and the international palate from the very beginning. It’s not just Asia & the Middle East but also the islands of Great Britain to the coast of Australia, from the land of the kiwis to the United States of America that we connect on a gastronomic level. 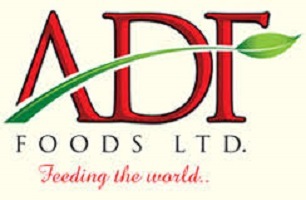 ADF Foods Limited has informed BSE that the meeting of the Board of Directors of the Company is convened to be held on June 05, 2018, inter alia, to consider buyback of equity shares of the Company. (i) The Board of Directors at its Meeting held on 5 June 2018 has inter alia approved the buyback of equity shares of the Company having F.V. of Rs.10/— per equity share through open market purchase through Stock Exchange subject to the shareholder's approval by way of a Special resolution through Postal Ballot and all other applicable statutory and regulatory approvals. (ii) The buyback of Equity Shares shall be at a price not exceeding INR 300 per equity share of Rs. 10/- each for an aggregate amount not exceeding INR 30,00,00,000 (Rupees Thirty Crores only) . The Maximum number of shares to be brought back under Buyback shall not exceed 10,00,000 (Ten Lakh) equity shares representing 4.71% of the existing paid up capital of the Company. ADF Foods Limited will buyback 10,00,000 shares(calculated by dividing total shares to be buyback/no. of working days) every morning at Current Market Price subject to the Maximum price of Rs. 300 as mentioned in the buyback offer. As an investor, one can place sell bid in the market similar to the selling of normal shares.